Notes: Challenge exams available. Online HIM degree option available. Institution offers an organized system of getting in touch with HIM professionals during the student recruitment effort. Notes: Special counseling services for returning students. Challenge exams are available for required courses. Institution offers an organized system of getting in touch with HIM professionals during the student recruitment effort. Program: Traditional-Day, Some evening and distance learning classes in general & related classes only. Notes: Special counseling services for returning students. Challenge exams are available for some courses. Notes: Program is available online, with the exception of three professional practice experience courses to both full-time and part-time students. Program: Distance Learning via Internet and some traditional day courses. Notes: Challenge exams are available for required courses. Institution offers an organized system of getting in touch with HIM professionals during the student recruitment effort. Program: Distance learning via intranet with the exception of the general education courses and professional practice experience. Program: Traditional-Day (Gen Ed/Related course options) or 100% Distance Learning! 7 programs of study to meet your needs or ask about special programs! 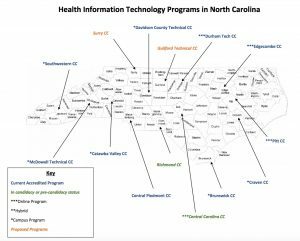 Coding Diploma and Associate of Applied Science Degree in Health Information Technology programs. Notes: Special counseling services for returning students. Institution offers an organized system of getting in touch with HIM professionals during the student recruitment effort and following graduation. Program: This is an internet program except for sciences and PPE (clinicals) which are taken at the student’s home location. Notes: Challenge exams and credit by exam are available for required courses. Full-time or part-time enrollment possible. Notes: Some general education courses offered through distance learning. Some HIT classes are offered online. Challenge exams available for some required courses.